$699 Doesn’t seem that cheap at all, but for an electric longboard it’s one of the most affordable prices on the market at the moment. 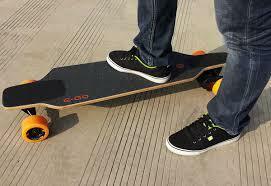 Yuneec designed this electronic longboard, called the E-Go Cruiser, with a speed up to 18 miles (or 30 km) per hour. That’s quite a lot if you know that the average speed of e-longboards is between 5-10 miles (or 8-16 km) per hour. A reason for the E-Go Cruiser to be able to go that fast, is because it’s really light, only 14 lb (or 6.3 kg). For more information or to order your own E-Go Cruiser, click here.